Monica Martinez cannot afford to live alone on university pay, even after 18 years as a nursing aid at the University of California, Los Angeles Medical Center. Martinez said she works only 24 hours at the medical center each week because the university has turned to contractors who pay lower wages. She works a second job at a nearby hospital and lives with her sister to make ends meet. “It’s disheartening for those of us who have invested our time and our lives in the University of California,” said Martinez, who is 45. On Monday, she joined 53,000 medical and service workers on picket lines at all nine University of California campuses, bringing a wave of strikes in public education to one of the largest university systems in the country. Over 24,000 of the workers on strike are represented by American Federation of State, County and Municipal Employees Local 3299, which called for the strike after more than a year of failed negotiations with the university. The other tens of thousands of striking workers are nurses and medical technicians protesting in solidarity. Lybarger said the three-day strike will be “quite a disruption, especially at the hospitals,” which have canceled surgeries and delayed cancer treatments for hundreds of patients. However, she adds that 113 medical workers have volunteered to cross the picket line in the event of a life threatening emergency. The workers say that they are protesting galling racial and gender inequality in the university system. On average, Latinos at the University of California earn starting wages 21% lower than white workers, and Blacks earn 20% less than whites, according to a study conducted by AFSCME. Meanwhile, starting average wages for women are as much as $2 per hour less than men according to AFSCME’s study. 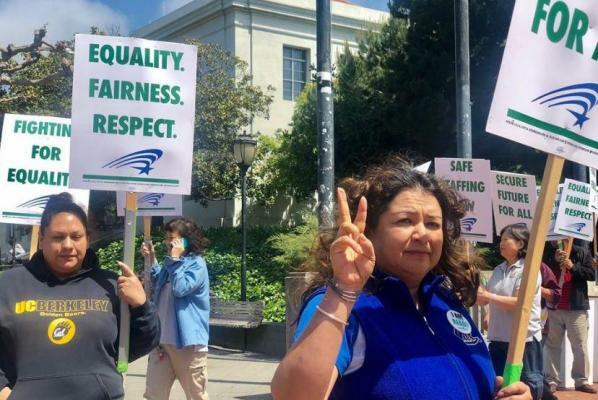 “We cannot confirm the accuracy of the report created and written by AFSCME, and it was not part of the independent fact finding that was conducted as part of our negotiations,” Doan said. The union has called for yearly wage increases of 6 percent, a freeze on health-care premiums and an end to the outsourcing of jobs for which its members are trained. Doan, the University spokesperson, said the proposed raise is nearly double what other University of California employees have received, and highlighted an agreement with the union that allows the University to sub-contract existing work, unless the sole reason for doing so is to save money on employee wages and benefits. Lybarger said dozens of student organizations support the striking workers, noting an underrepresentation of African Americans in the student population that mirrors that of the workforce. “It’s false opposition to pit workers and students against each other,” Lybarger said. Service workers, like janitors and security guards, make up 9,000 of the AFSCME workers on strike; while the other 15,000 are medical technicians and nursing aids. The service workers’ contract expired last June, and the medical workers’ deal expired last December. U.S. Senator Kamala Harris’ office told Payday Report last week that she will skip a planned commencement address at the University of California, Berkeley on May 12, unless the UC system and its workers have reached an agreement. AFSCME Local 3299 also expects U.S. House Rep. and longtime activist John Lewis (D-Georgia) to make the same commitment in advance of his commencement address at the University of California, San Diego on June 16. “It would be shocking if he didn’t, given his iconic status fighting for workers’ rights and civil rights,” Lybarger said. Lewis’ office did not immediately respond to a request for comment. Martinez, the nursing aide, is a member of the negotiating team that has bargained with the University. She intends to picket all three days of the strike. Be the first to comment on "53,000 University of California Workers Strike to Close Racial and Gender Pay Gap"